We are a family owned and operated business in beautiful Myakka City, Florida. Our apiary (bee farm) is nestled in a country setting surrounded by pasture land, large oaks, saw palmetto and we are just 1 mile from the Myakka River (as the bee flies) and acres of citrus groves. 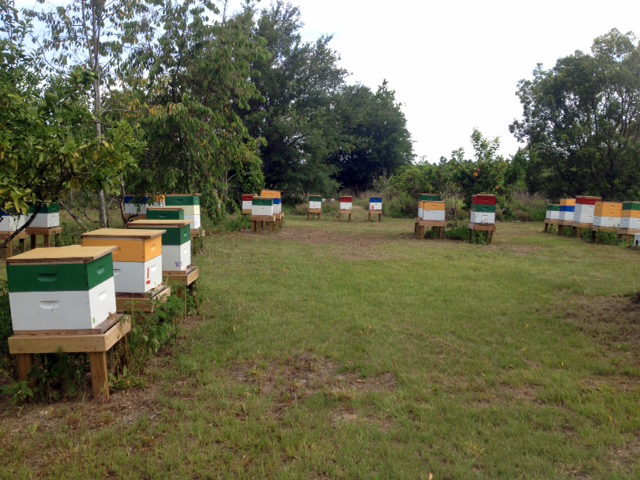 If you are looking for local raw honey near Sarasota, FL and have a chance to stop by our farm, we'd love to meet you. Of course we also ship a little bit of the Sunshine State nationwide. We are proud to produce and supply you with the finest natural raw honey and bee hive products. Bees forage for up to 3 miles distance and find their way back to their hive. Even when hundreds of hives are present. Bees use glands on their abdomen to excrete a small flake that give us the wonderful product of beeswax. The average life span of a worker bee in the summer lasts only six to eight weeks. After the bees work, we can enjoy the bountiful blessings of pure honey as it comes directly from the hive, bottled for us to enjoy not only its sweet taste, but it's many other benefits.